Some prophecies are simply false. Others are toxic. This video explores how to tell the difference between the two and what to do about defilement from toxic prophets. Cost includes 428 days of access after purchase date. This video explores how the prophetic movement got distorted, but more particularly, how you can identify a toxic prophecy. One of the earliest marks of a toxic prophecy is that your connection with God or your intimacy with God is decreased. 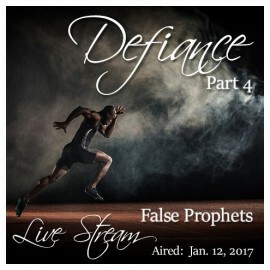 Arthur explores other markers that will allow you to look at the past prophecies you have received and determine if there are any that are suspect. The video concludes with tools to extract yourself from the damage done by a toxic prophesy. The Communion service is specifically a warfare time to release those who have been trapped through no fault of their own in a prophecy that has been damaging and has been devouring their spiritual or their external life. This truth was over the top for me. Because of this teaching, I was able shift a couple of key things in my life. For at least ten years, I have not been able to hear from God directly. I knew why, but I couldn't break free from it. It stemmed from moving Holy Spirit aside (up until that point we had a very direct communication between us) and replacing His voice with that of a prophetic word. Because prophetic words were new and fun for me. With Arthur's help, I was able to break that pattern off my life, and I have a desire to read the Word and talk with Him again!!! It's huge!!! Also, I was able to trace back to a massive starting point, where I went wrong due to a false word from a spiritual father. I have lost much, but God redeems and I am just thankful that a twelve year holding pattern of being lost in my purpose has been broken. Please listen with an open heart. It could change your life. I appreciated this stream SO MUCH. Arthur stands as a prophetic voice that does not flaunt itself or expect the recognition of the world, but which has stood the test of time and come out with integrity and solidness. I have spent 12 years hearing prophetic words over me & others that were obviously some truth, some questionable, and have found it very difficult to always know the difference. In this stream, Arthur speaks clearly and bluntly, and yet always with love and compassion, about the whole prophetic movement, and brings his signature light and truth into that confusion. The Communion prayer at the end comes as a great relief, to cleanse all "slime" that most of us have experienced from well-meaning but unhelpful prophetic words during our lives. Thank you, Arthur! A huge relief. Each of the sets of the five Worship & Warfare streams have impacted me deeply. I find myself going back to them, even re-purchasing as needed, to receive again from that stream. Arthur's power in deliverance is sufficient that if I need an extra push in trying to dislodge something, I will listen to the particular stream where he is doing warfare against that particular critter, and it's always effective. If I'm feeling disconnected, they help me re-connect, because the strength & love of the Sapphire community is tangible in waves throughout each stream. I find myself hoping that all of these streams could turn into a DVD set, because I love having them as tools, even after the warm glow of the actual event has become history. I refer to them time after time after time! For many years I believed and worked on making a prophetic word come true. Inside, my spirit was crying out for more, I knew that I HAD more than this, and I felt so trapped by deliberately forcing myself to fit in. Listening to this live stream teaching, the Lord allowed me to experience freedom in that He released me from a cloud of oppression (false prophetic word) that bound me to a certain way of life for over 10 years. About 30 minutes after the warfare the Lord spoke to me in such an intimate manner it left me weeping - with fullness and refreshed destiny. I sincerely recommend this teaching and warfare to every person who is trapped in a word that the Lord didn't release over them. Wow, I can see why you had warfare the day of this LiveStream. This LiveStream was so significant, and of utmost importance to be heard at this time in the history of the church. It brought me so much revelation on certain blockages in my life due to false prophetic words. The prayers Arthur spoke over us were very powerful. The subject of not being able to hear the Lord due to a false prophetic word was huge. Truly profound information. The communion time was also full of impact, and I experienced freedom in new ways, and gained new perspective on areas of challenge in my journey that I had no answers for. Now I have answers. This teaching was revolutionary. Thank you Arthur & Team! The prophetic community seems to specialize in spiritual mugging. What do you do if you have been assaulted by a prophecy you don’t want? How can an unwanted prophecy cause damage to you? This video clip explores the tough issue of toxic prophecies.